Members of the US-led international coalition fighting the terrorist group Islamic State (IS, formerly ISIS) met in London, but the high-profile event’s participants doesn’t include those doing most of the fighting on the ground – the Kurds. The Kurdish leadership didn’t overlook the absence of an invitation to join the 21 members of the coalition on Thursday. “I express my and the Kurdistan people’s disappointment with the organizers of this conference and it is unfortunate that the people of Kurdistan do the sacrifice and the credit goes to others,” said Iraqi Kurdistan Region President Masoud Barzani in a statement. “The people of Kurdistan bear the brunt of this situation and no country or party can represent or truly convey their voice in international gatherings,” he added. Barzani’s irritation is understandable, considering that Kurds in both Iraq and Syria have been fighting against IS for months, defending predominantly-Kurdish territories and at times conducting counter-offensives. The conference came a day after the Kurds launched a major operation west of Mosul, Iraq’s second-largest city, in which as many as 200 IS fighters were reportedly killed. Kurdish forces are paying the price in blood, with more than 700 members of the Peshmerga, the Iraqi Kurd militia, killed in action as of mid-December, according to the Kurdish government. Their resolve is in contrast to the US-trained Iraqi army: entire units fled or defected last year, when the Islamic State started their lighting onslaught in Iraq. While Kurds are of great use to the coalition, their linchpin role in fighting the IS on the ground is burdened by an awkward aspect they bring into the equation of regional politics. Kurds, who live in territories of Iraq, Syria, Turkey and Iran, are the world’s largest nation without a national state of their own, and separatist moods have been strong among them for decades. In Turkey, the Kurdish militant movement PKK is considered a terrorist organization due to armed struggle it has waged against the government in Ankara. But Western nations pressured Turkey to allow PKK fighters cross the border into Syria to help fellow Kurds fight against the Islamic State. In Syria, the Kurdish population has been keeping a distance from various groups seeking to oust the government of President Bashar Assad, both those supported by the West like the Free Syrian Army and those shunned by it like the IS and Nusra Front. In the early months of the Syrian civil war Assad’s government sought to win over Kurds by alleviating decades-old grievances, such as giving them full Syrian citizenship. The non-interference agreement between the two forces has largely held over the years. And in Iraq the Kurdish population enjoys a large amount of autonomy, with Iraqi Kurdistan becoming largely independent from the central government. Some things, such as acquiring weapons abroad, Baghdad wants to keep under its control, so it had to swallow a bitter pill when the US airdropped supplies, including weapons, directly to the Peshmerga. 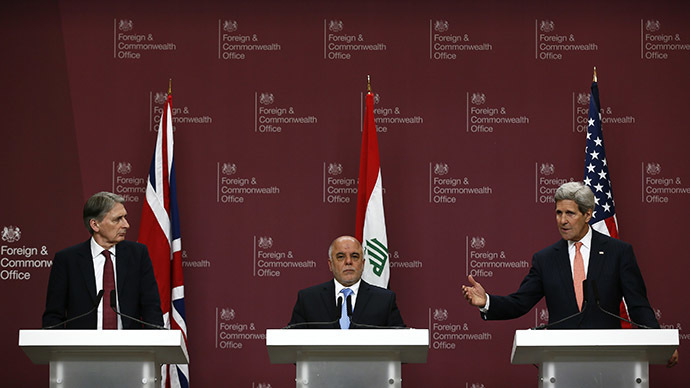 Unlike the Kurds, Iraq was represented at the London conference by Iraq Prime Minister Haider al-Abadi. The event was co-hosted by US Secretary of State John Kerry and British Foreign Secretary Philip Hammond. The Iraqi official said his country needed more weapons for the army to continue fighting against the Islamic State and warned that falling oil prices are undermining Iraq’s military capabilities. Kerry hailed the bombing campaign as a success, saying it managed to kill half the top IS commanders and killed thousands of low-ranking fighters. He added the money would continue flowing into the campaign, which he expects to continue for two more years before the terrorist group is defeated. "We don't want to see a reverse of our military victory because of our budget and fiscal problems and we have been assured that every member of this coalition will stand with Iraq in its fight against Da'esh [IS]," Kerry assured.